When buying or reviewing sports headphones, I always ask myself first: "What stops these earbuds from slipping around or falling out?" 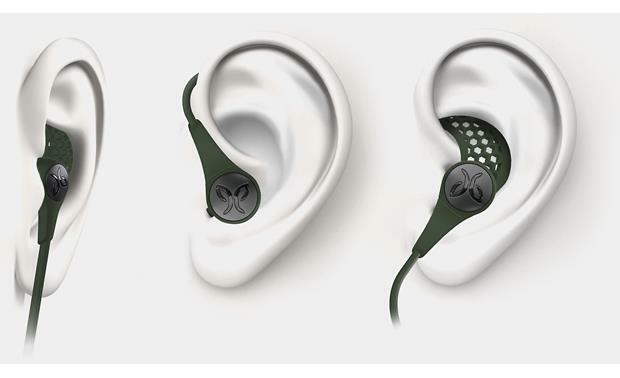 The sweat-proof Jaybird X3 wireless headphones come with different-sized silicone ear "fins" to help keep them in place. And you can route their connecting cord either below or up and around your ear so they feel comfortable — even inside a bike or ski helmet. 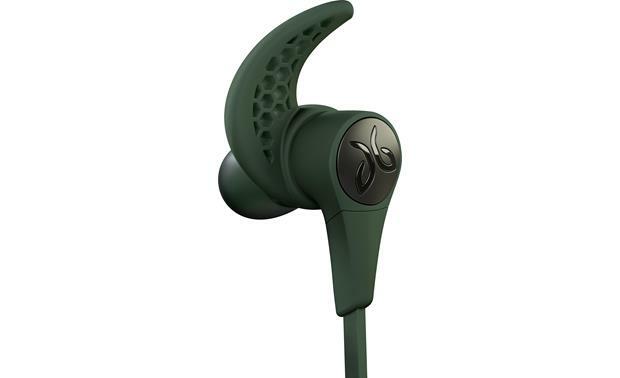 The Jaybird X3 Wireless headphones fit securely in your ears and have a flexible cord routing system. You won't have to run a cord to your phone, thanks to built-in Bluetooth. So while you pound the pavement, hit the trail, or just mow the lawn — admittedly the extent of my physical outdoors activity — the X3s will stay in your ears and out of your way. 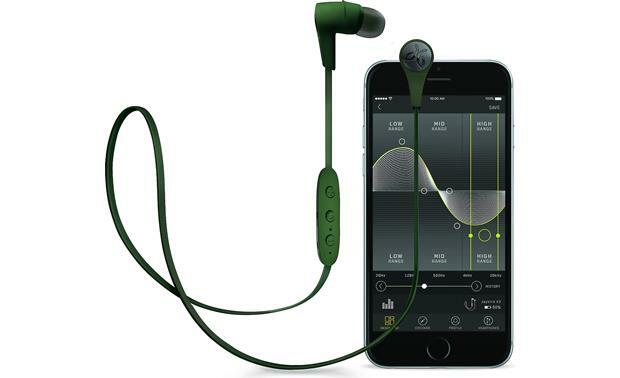 These earbuds are tuned to deliver a energetic sound profile that keeps you motivated. 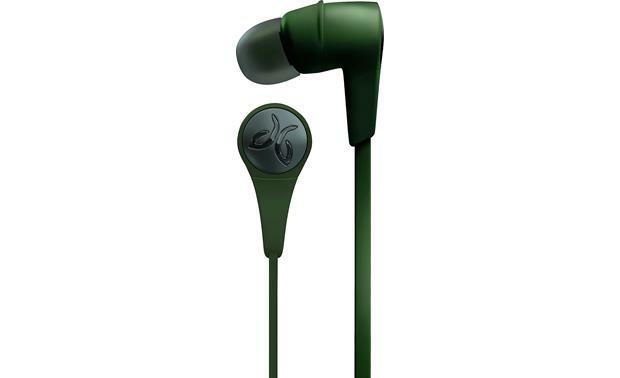 That means you get the punchy, powerful bass that makes Jaybird a popular choice with the gym crowd. And if you want to tweak their signature sound a bit, Jaybird's MySound app is available for download on Apple® or Android™ devices. You can adjust the EQ and customize the sound using the app. 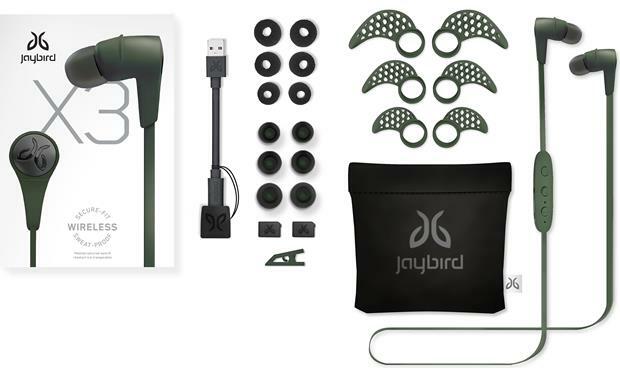 Jaybird is hyper-focused on ensuring you find a good fit. How do we know? They've included three pairs of ear fins and a six pairs of ear tips, so you can find ones that match your ears well. 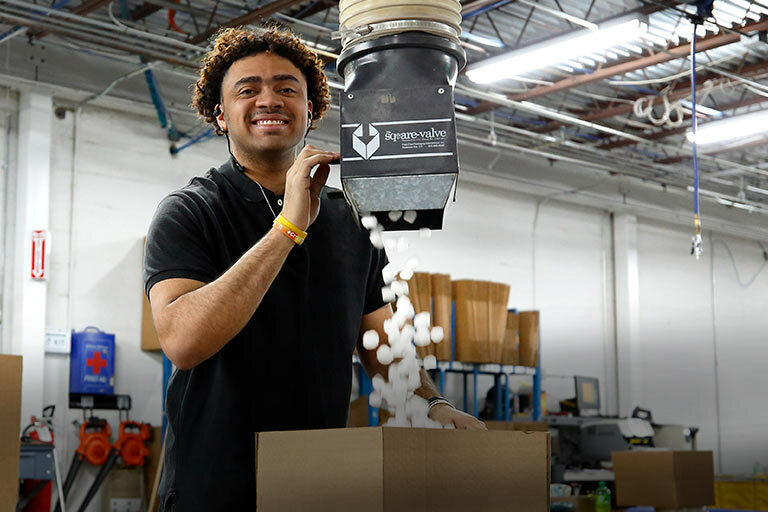 There are three sizes of silicone tips and three sizes of Comply™ memory foam tips. I'm a big fan of Comply foam tips — they're my personal favorite — because they fit snug but feel light and unobtrusive. Just be advised that these foam tips create a tight seal that isolates noise. That's great when you're working out or cooling off inside, but you probably want to stick with silicone tips when you need to be more aware of your surroundings. It's everything as advertised and then some. A very high quality product. Easy to set up and the sound is excellent. I am not a fan of many of these wireless headphones that the neck wire is flimsy/thin? I was wondering if this model has a decent diameter/weight to them. Any inputs here are appreciated. The weight was very little and seemed adequate but I didn't like the sound at all. 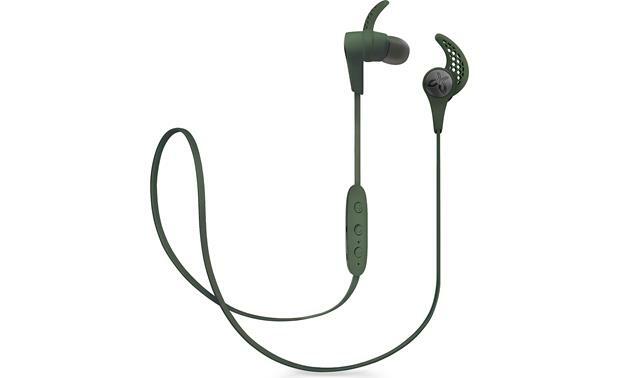 Earcup Width x Height 0.533" x 0.533"
Overview: The Jaybird X3 in-ear wireless sport headphones are designed to withstand the rigors of your workout. Not only are the headphones waterproof and sweat-proof, but they will stay in place, no matter what your level of activity. 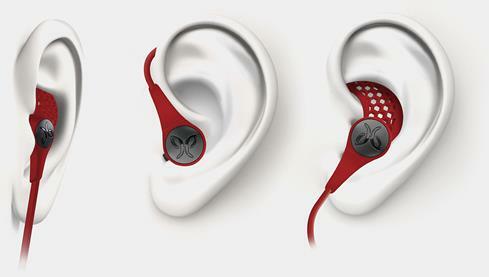 The X3 comes with six pairs of silicone and memory foam ear tips, secure-fit ear fins, cord clips, and a shirt clip. Your headphones and accessories can be stored in the supplied water-resistant pouch. 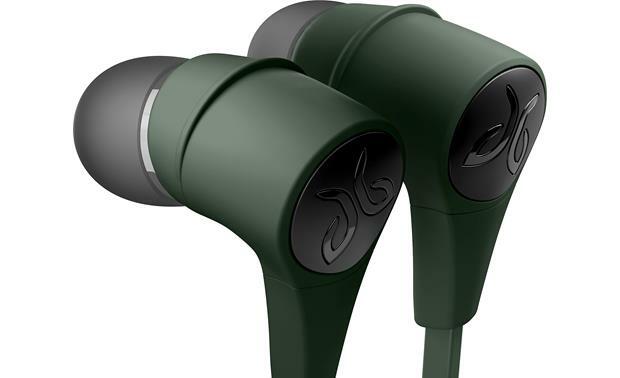 Ear Tips: The Jaybird X3 in-ear headphones feature smaller ear buds than previous models to fit smaller ear canals. It is small enough to allow you to wear them inside of a full helmet. The package includes both silicone and Comply memory foam ear tips in three sizes each. Three sizes of ergonomic Secure-Fit ear fins are available for greater comfort and fit. Over/Under Ear: The X3s can be worn in different ways depending upon your intended use. 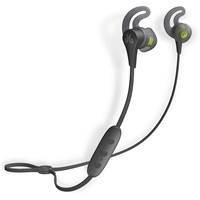 If you wear them during rigorous sports, running, or biking, it is recommended that you choose the over-ear sport fit. The two included cord clips can be used to take up the slack of the connecting cable and get a snug fit around the back of the head. If using the X3s for casual listening, the under-ear casual fit is recommended. The included shirt clip lets you attach the cord to the collar of your shirt. Multipoint: Multipoint allows you to be connected to two devices simultaneously. While you are paired to your laptop and listening to music, you can accept a phone call on your paired cellphone. The X3 will remember up to 8 paired Bluetooth devices, and can be actively connected to two of them at a time. Share Me: The Share Me feature allows you to share the music you're listening to with another pair of X3 headphones. Smartwatch Compatibility: You can sync your smart phone with a smartwatch, and leave your phone at home while you run or ride. This feature works with the Apple WatchOS, Samsung Tizen, and Android Wear. MySound App: The Jaybird MySound app, available from the App Store and Google Play, lets you customize your EQ settings to your listening tastes. You can sample the EQ presets of numerous athletes and artists, and download the ones you like to your headphones. You can even create your own sound profile and save it to your X3s or share it with others. The MySound app is compatible with Android devices running OS 4.4 and up, and with iPhones and iPads with iOS 9.0 or later. Battery: The Jaybird X3 is powered by a 3.7-volt Lithium-Ion rechargeable battery. The battery charges in approximately 2.5 hours via the included USB cable (5V 500mA power source recommended). A fully charged battery provides approximately 8 hours of playback time. The Quick Charge feature will provide 1 hour of playback time after a 20 minute charge. In-line Remote/Microphone: The headphones have an in-line 3-button remote control for power, Bluetooth pairing, music playback, and phone calls. The remote includes an integrated omnidirectional microphone for phone calls and voice assistance. Dimensions: Ear Bud Diameter 0.533" Depth 1.103"
There is a cord management clip that you can thread the wire to adjust to your liking. They are light and I am still using both the X2 and X3. Sound quality is good off my Apple Watch for a run or recreational use. I have not had any issues with the wire fraying and I have used both sets frequently. The neck wire is fine and well made.